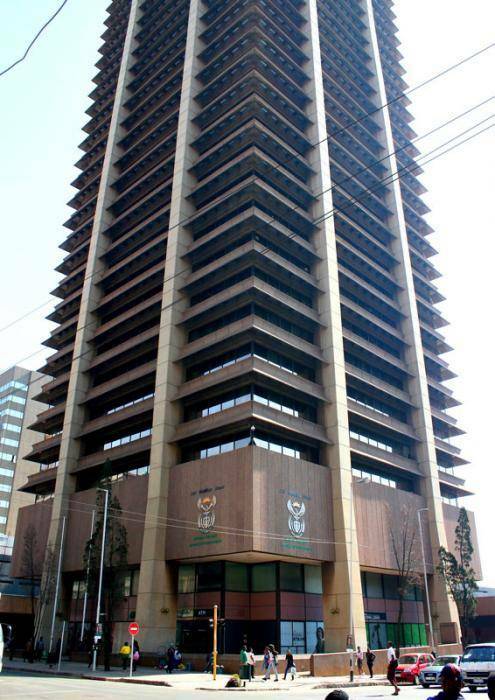 This prestigious 31 storey high rise building is located on the corner of two main street arteries in the CBD of Pretoria, providing it with excellent public transport. The building has an open area around the office tower and a recreational garden area with restaurant facilities, which make it unique in the Pretoria CBD. The office tower provides 28 745m² of modern versatile office accommodation on 28 office floors. The offices have continuous windows which, from the higher floors, provide an impressive panoramic view of the Pretoria surroundings. At ground floor level, 1 985m² of shops are provided. With a modern central air conditioning system, a comfortable working environment is provided throughout the year. 9 Modern high speed lifts cater for the vertical transport. To provide for the parking needs of the occupants, 335 parking bays are available on two basement levels and in an adjacent structure.